Surface RT, Surface Pro combine for No. 5 spot. Microsoft is in it. In it to Win8. It was no surprise to see worldwide tablet shipments continue to surge in the first three months of the year, but it was notable that Microsoft Surface tablets made the top five for the very first time. 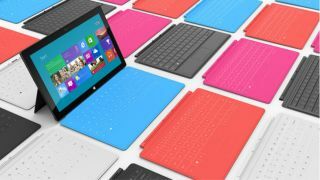 The Windows 8 company was able to move 900,000 of its Surface RT and newer Surface Pro tablets in the first quarter, according to market research firm IDC. Those numbers translated into 1.8 percent of the tablet market share for the first three months of 2013. "Many of those units were Surface Pro, which the company started shipping to the U.S. and Canada in February," noted IDC in its report out today. Microsoft, as IDC pointed out, has said that it is actively widening the region distribution of its Surface RT and Surface Pro tablets. That's good news because while Microsoft was able to make the cut in the top 5 tablet shipments, the gap between it and No. 4 tablet maker, Amazon, is fairly wide. Amazon shipped 1.8 million of its Kindle Fire and Kindle Fire HD line of tablets with a 3.7 percent market share. "[Amazon is] once again the victim of a highly seasonal product cycle," wrote IDC. Filling Amazon's former No. 3 shoes is Asus, which performed well due to its heavily marketed Nexus 7 tablet. "With Google's I/O conference right around the corner and expectations of an imminent device refresh, [Asus] will need to find a way to sustain its momentum." It was no surprise that Apple and Samsung remain the tablet market leaders this quarter. Samsung was able to maintain its No. 2 status with 8.8 million shipped and 17.9 percent market share, which IDC called "above expectations." Meanwhile, Apple also outperformed Samsung and IDC's most recent projections for the quarter, shipping 19.5 million tablets and 39.6 percent market share. "Sustained demand for the iPad mini and increasingly strong commercial shipments led to a better-than expected first quarter for Apple," said IDC Research Director of Tablets Tom Mainelli. "By moving the iPad launch to the fourth quarter of 2012, Apple seems to have avoided the typical first-quarter slowdown that traditionally occurred when consumers held off buying in January and February in anticipation of a new product launch in March." As the two market leaders, Samsung and Apple helped drive total shipments to an impressive 49.2 million units for the quarter, according to the IDC report. In addition to providing research data, IDC played referee on hype surrounding Surface Mini and Surface 2 tablets that could compete with iPad mini and the expected iPad mini 2. "Recent rumors have circulated about the possibility of smaller screen Windows RT and Windows 8 tablets hitting the market," said Ryan Reith, the firm's program manager. "However, the notion that this will be the saving grace is flawed." "Clearly the market is moving toward smart 7-8 inch devices, but Microsoft's larger challenges center around consumer messaging and lower cost competition," he noted. Addressing these more important issues, along with releasing Surface Mini tablets, could see Microsoft make further headway in 2013 and beyond, Reith concluded. With the tablet market fueled by 49.2 million total shipments this quarter and 142.4 percent year-over-year growth, at least the formerly software-only Microsoft has addressed the issue of never producing its own hardware.